If you were a kid in the early 90's and were into video games, there's a good chance you had a Nintendo Gameboy. Shoot, that sentence describes me to a "T", and while I never had one, I sure did play my friends’ Gameboy a lot. I bring up that bit of nostalgia (do you know where your Gameboy is?) 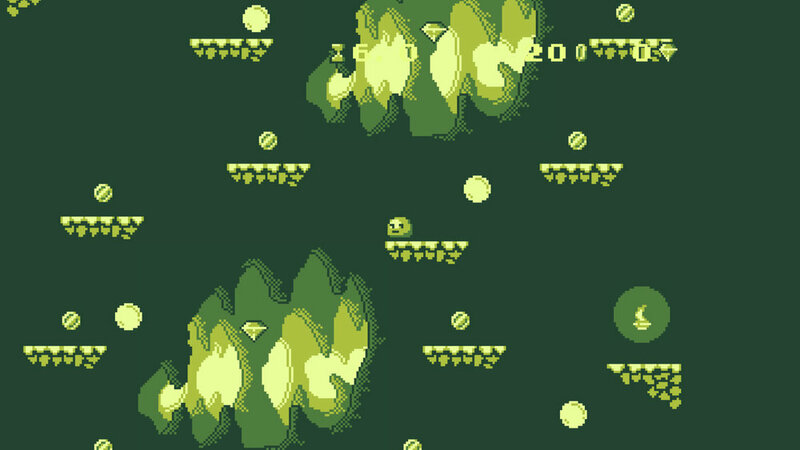 as the game we're looking at today looks like it belongs on that old-school Gameboy, with its distinctive green hue visuals. Is Awesome Pea a type of game that's going to bring back good memories, or is it a vegetable not worth your time? Awesome Pea is a straight-up platforming game, as you control the titular pea (who we assume is awesome) and go from level to level collecting coins, gems and, well... trying to stay alive. To be clear: there is no story here whatsoeve, just pure old-school platforming. I suppose the immediate comparison here is Super Meat Boy, as you die in one hit to everything, but while Awesome Pea is certainly challenging, it's not quite on that level. You are treated to a total of 30 levels and they'll increase in difficulty over time. In general, though, each level has a number of coins and gems to collect. You don't have to collect them, of course, as survival is ultimately the name of the game, but there is literally a trophy for completing each level 100% here (so, a little extra incentive for completionists). Awesome Pea himself controls comfortably with PS4 controller, but I just stuck to the d-pad as using the analog stick just felt off a bit (and you need good controls with a game like this). Thankfully, you do have a double jump here, so that combined with the d-pad control makes this a comfortable game to play. Now, the visuals are an interesting tale. 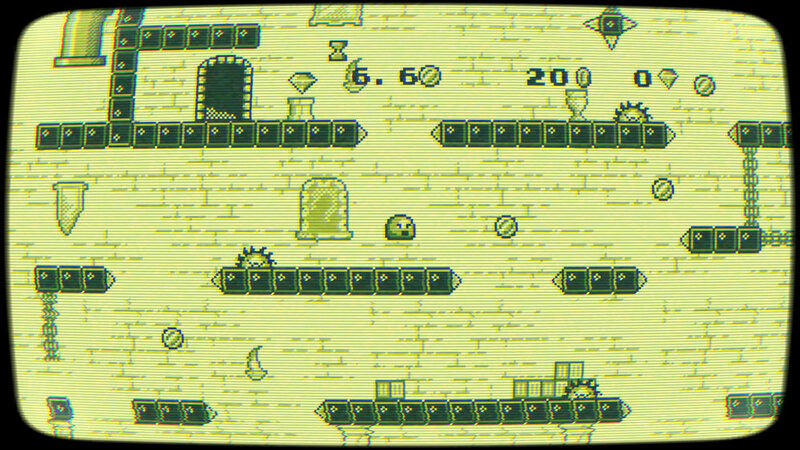 Awesome Pea obviously looks like a Gameboy game, and that's what drew me to it, but there are options for more of a CRTV look or toning down the retro look as well. Up to you. The game then has a number of backgrounds for each level. Does that sound weird? It sounds obvious, right? However, there's only a handful of background levels here. You have your train level, your prairie level, your cave level, your dungeon level... then another train level. The game re-uses a lot of backgrounds (as well as audio), but hey, it's a cheaper game, we all know this. There is also an over-world that you will choose levels on that works well enough, although late in the game my character just disappeared from it. Not game-stopping, but an obvious bug. Old-school gamers will also appreciate the chiptune soundtrack here as well, which is definitely catchier than I thought it was going to be. As good as it is the first time around, though, it wears out its welcome fairly quickly as the tunes follow the levels, which just repeat and repeat and repeat. I did like the fact that the music continues even after you die (it would have been annoying otherwise), so while the audio here is definitely solid, it can definitely get very repetitive! When it comes to re-playability, well... I suppose you can go back to levels and try to get every coin and gem you may have missed. Get that platinum trophy? Try for better times? Yeah, there's not much of a reason to play again once you've finished the game. It’s good for some pick-up-and-play if you are really desperate for a platforming fix. Thirty levels also isn't a whole lot in the long run, but given the game's price point and overall difficulty curve, I was pretty happy overall. In the end, if you are just looking for a no-thrills platforming game, Awesome Pea may just be for you. Granted, it’s pretty short, but the price point is right and the controls and difficulty are on par. It also doesn't hurt that there are plenty of trophies to earn along the way! If that sounds awesome to you, this Pea is worth a shot. It's good to meet you! I'm better known online as "Bkstunt_31" and have been writing Reviews and video game Strategy Guides/Walkthroughs for WAY too many years! Feel free to stop my my Facebook page and say hello! Have fun and keep playing! In the end, while the story is regrettably un-memorable and fairly lacking, the game play makes up for it with several clever, strategic spins on time-tested game play mechanics. Back that up with solid graphics and audio and you have yourself an old-school RPG that should scratch that itch you've been having. In the end, if you enjoy puzzle games, Grim Legends: The Forsaken Bride may be right up your alley. With its variety of puzzle types, a fairy-tale story for some minor plot distraction, and a helpful hint system in place, this is a fairly easy game to recommend to any pure puzzle fan. While this review is for the PS4 version (Energy Cycle is also out on Steam and Xbox One), I can't help but think this type of simplistic puzzle game is better served on mobile devices. It almost seems like wasted potential, honestly. Weird, right? Regardless, outside of die-hard puzzle lovers though, Energy Cycle is just too repetitive to really recommend to anyone. it doesn't have the deepest combat system out there, and its isometric graphics aren't what anyone would call top-notch (although both those things are solid for an indie title). But what it does have is a lot of HEART. The story is intriguing and well told and the audio is just fantastic. If you're looking for a song to get lost in, Maquerada may be just what you're looking for. Playstation 4, ReviewsGregory Wright July 27, 2018 Mega Man X, 20XX, Mega Man, Mega Man Clone, Batterystaple Games, Fire Hose Games, roguelike, PS4 Roguelike, tight controls, SNES style game, PS4 Platformer, PS4 Indie, great replayability, Indie Platformer, Indie, PS4, Platforming, precise controls, great soundtrack. While there's not much to say about the story, if you came here looking for classic Mega Man X gameplay, you just hit the jackpot as 20XX is a love-letter to its genre!